For a short explanation about the divisions that make up amateur basketball in France: NF1, NF2, NF3 and youth basketball you can simply scroll down the page or click on the link that interests you. Under the Fédération Française de Basketball (FFBB) amateur basketball in France for women starts in the second division better known as Nationale Féminine 1 (NF1). This division is situated on the second level of the women’s basketball pyramid. The word amateur is used to describe this league because teams only play matches once a week during the weekend, usually Saturdays. The season has a programme of 30 games and the richer clubs in this division have full-time professional players on their roster. These players tend to work for the club or community as trainers for other teams of the club or help run training sessions in the community. While the number of professional players are increasing each year the bulk of the players are either students (youth players U18, university / higher education) and amateurs that practise a profession outside basketball. The structure of the competition is explained in the competition guide. NF1 teams participate in the French cup alongside the professional clubs from the Ligue Féminine de BasketBall. The second amateur basketball league for women playing basketball in France is Nationale Féminine 2 (NF2). In order to help reduce the cost of travelling the 56 clubs in this division are split into four regional groups of 14 teams. The matches are normally played on Saturday. Last season the FFBB introduced a new rule for clubs in the LFB: by 2008-2009 their second team must be in this division. Clubs like Aix-en-Provence, Bourges, Montpellier, Tarbes and USVO have already had programmes in place and have development teams made up of players from their basketball academies, centre de formation in NF2 and they have managed to survive last season. Mondeville was not so lucky and are back in NF3 for this season, while Villeneuve d’Ascq won promotion form NF3. 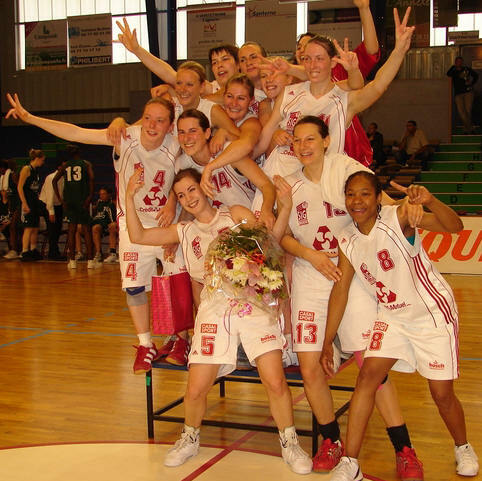 The FFBB created an amateur version of the French cup in 2004 for clubs in the lower division starting with this division. In addition to the second teams from the LFBB the CFBB (see below for explanation) has a side of talented 15/16 year-old players that also play in this league. While only the winner from each group qualifies for promotion to NF1, four teams from each group face relegation to NF3 at the end of the season. The CFBB (Centre Fédéral de Basket-Ball) is a team of young women playing basketball based at INSEP (Institut National du Sport et de l'Education Physique) in Paris. The third amateur basketball division run by the FFBB at national level is Nationale Féminine 3 (NF3). There are eight groups of 12 teams with the groups split into regions. Games are normally played on Sunday afternoon. All the clubs in the LFB that are not represented in NF2 must have a team in this division. The one exception is that of Arras. Arras finished last in their group last season. 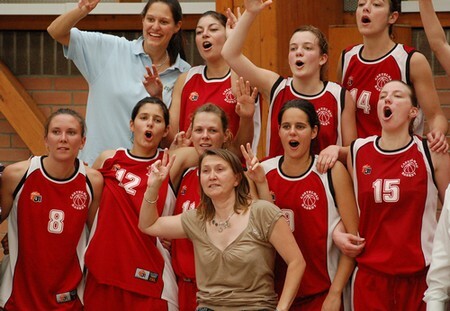 Due to the regulation of the FFBB they could have remained in NF3 but decided to accept the relegation. This division is very competitive as four teams face relegation from each group at the end of the season, which means they are back to the regional leagues (not governed by the FFBB). The rest of the amateur leagues below the national structure are run by the various regions in France. The FFBB also runs two national youth leagues with Minimes (U15) and Cadettes (U18. The Federation has become very strict on the number of games youth players are allowed to play in a weekend: all players up to minimes are only permitted one game per weekend. It is only from the category of Cadettes that a player may be able to play two games a weekend. The only exception to the rule of the Minimes is when they play triangular competitions and final 4s at the end of the season. The National French cup competition is played only for the U18 age group. Go back to the Amateur information section.